How many fields do we play on? Over the years we have expanded and we currently have 6 fields at TNT Paintball ranging from about 1/2 acre to 3 acres in size. Each one has it’s own unique theme and each one plays completely different from the others. We usually play one or two 15 minute games on a field and then we rotate and move to another field. If you attend a full day, chances are you will play on all of the fields during the day. If you are there for the suggested minimum of about 3 hours, you will most likely play on at least 3 fields, but possibly more. 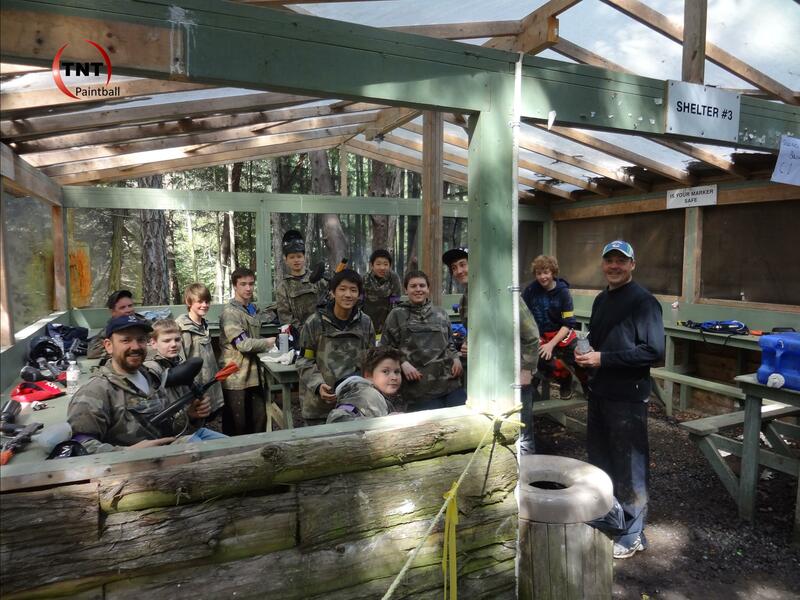 One major advantage to having 6 fields is that we can run several groups or versions of paintball simutaneously, without any group having to wait for another group to finish playing and vacate the field. This means that at TNT Paintball, players do less waiting and more playing. The number of paintballs you will shoot will depend on a few things; how long you want to stay, how aggressive you play, and how careful you are with your shots. We’ve been facilitating paintball games for a long time and have had over 100,000 customers enjoy themselves at our facility, so we can tell you what the average has been over the years. In a nutshell, the average player has shot approximately 100 paintballs per hour of stay at our facility. That average includes the very aggressive players and the very thrifty, careful players. If you are planning to stay for most of the day, as the majority of our customers end up doing, you will save some money by purchasing a bag of 500 paintballs right away. If you are not sure though, you can purchase as little as 100 paintballs to start and then just purchase more as you need them. It’s up to you how long you want to stay and play. Once you are equipped and have watched the video on safety rules and general rules of the game, you will start playing 15 minute long games with a short break between each game. You can leave whenever you like or stay right until the end if you like. The majority of our customers do. We recommend about 3 hours as a minimum including the sign up and orientation procedure. How many paintballs you want to buy will have some bearing on how long it will take as well (see above). Does it hurt and what should I wear? Short answer: yes. But how much you will feel will depend on which version of paintball you play (.50 or .68 calibre) and what you wear. Loose clothes rather than tight clothes will help. Also multiple layers will help as well. Shorts and tights are not recommended as you will feel the sting of the hit more on bare skin or when wearing clothes that are tight to the skin. Sturdy footwear is a must. Gloves of some sort are also not a bad idea as you will feel the hits a little more on your fingers. In our Kid’s Splat Ball games, not only do we use our smaller .50 calibre paintballs, but the paintballs travel at half the velocity, so the discomfort is very minimal, making it alot of fun for kids as young as 8 years old. Do I have to pre-register or pre-pay? No, you don’t have to, but we do not hold spots for you if you don’t as we get far too many people telling us they are going to be there “for sure” and end up not showing up. Meanwhile, we have hired and paid staff to be there. Therefore if you want to be sure of having a spot we suggest you pre-purchase packages through our booking system. Because it makes our lives easier, we also reward you with significant discounts when pre-purchasing packages rather than dropping in and paying for the packages on game day, so not only does it secure your spot, it also saves you money. When booking on-line, you are not obligated to, but you will have the additional opportunity to save even more if you decide to pre-purchase some paintballs as well. Also, on occasion we do not get enough players to have games on a Saturday or Sunday so if you are planning to “drop-in”, we suggest calling us a day or two in advance to make sure we have the type of game you are wanting play scheduled. Do you accept Debit or Credit cards at the facility? Yes, we take Interac as well as VISA and MasterCard at the field. Of course we also accept cash. We do not accept cheques unless prior arrangements have been made. We offer a lunch option consisting of a jumbo BBQ all beef hot dog with a can of pop or bottle of water for $4.00 plus GST. Lunch is usually served at approximately 1:00 p.m. and if you are interested in purchasing the lunch option, you need to do so by about 12:15 at the latest so we know how many dogs to BBQ. We also have a selection fo chocolate bars, chips and pop available to purchase at anytime during the day.